That is, if anti-immigrant policies don’t stop civic engagement in its tracks. 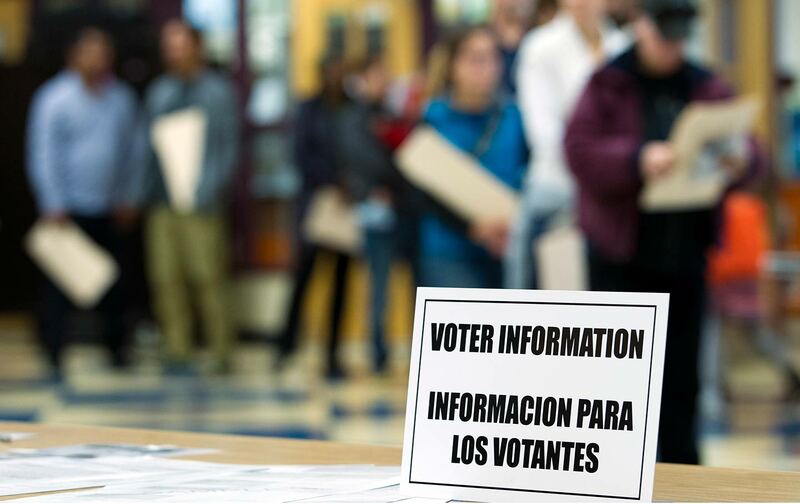 These most recent midterm elections left immigrants vastly underrepresented, with 25 million legally ineligible to vote and those who were eligible facing linguistic and legal barriers to the ballot box. The polls suggest that Latinxs were a major force in the Democratic turnout—more than one in four who voted in the last election said they were participating in their first midterm. But overall, recent surveys have shown lower levels of voting and other political participation for communities of color, particularly Asian and Latinx groups where younger immigrants and their children are changing the face of America’s electorate. Now we have an administration that is seeking to foreclose channels for immigrants to exercise their democratic rights, not just at the polls but also in their everyday lives—from voter suppression to immigrant detention, to the prospect of deterred from being counted in the next Census, immigrants’ rights are under attack in Trump’s America. Even if this president’s reign ends in 2020, his anti-immigrant policies could already be corroding the representation of immigrant communities for years to come. A new book on the intergenerational dynamics of immigrant diasporas shows that foreign-born children of immigrant families, known as the so-called “1.5 generation,” are both drawn to and deterred from the political process by various cultural and institutional barriers. One primary political challenge that many children of immigrants face is the reality of growing up in communities that are historically detached from politics. In general, immigrant communities skew Democratic, but overall these groups tend to engage less in electoral politics than US-born citizens. For Asian-American and Latinx citizens, including many immigrants, national surveys suggest they are far less likely to participate in a political meeting (such as a town-hall event or public hearing), or even engage in day-to-day political discussions, compared to their black or white peers—a pattern that stretches across socioeconomic groups in a way that has led researchers attribute the disparities to “language barriers and lack of adequate civic infrastructure and political mobilization,” rather than class. But it’s not just direct political experience that shapes young people’s political attitudes and drives toward activism. Educational background is heavily tied to political participation. According to the multigenerational analysis, by researchers at McGill, University of Essex, and University of California–Los Angeles, educational attainment for immigrant youth is deeply influenced by the level of family cohesion—the stability of bonds among members—as well as the strength of their parents’ economic relationship to home-country communities as evaluated through their remittances. Meanwhile, another increasingly common phenomenon among immigrants, family separation, has foreseeable negative effects; kids may be irrevocably set back in school when growing up with parents divided by borders. Not surprisingly, intergenerational trends among immigrant families suggest citizenship itself plays a role in political engagement. Immigrants who naturalize late in life, instead of, for example, naturalizing along with their parents, tend overall to be more “civically detached” compared to those who naturalized early. For immigrant children today, growing up under an aggressively restrictionist government, any barriers to getting on a legal pathway could have far-reaching impacts on future political engagement. Even if not active in politics, communities caught in the crosshairs of Trump’s border war can’t avoid reflecting on political issues. Recent Pew Research surveys suggest that, while many immigrants express higher-than-average optimism about “the American dream” and social mobility, their US-born second- and third-generation children are less likely to believe that they are living better than their parents, or that their kids will be relatively better off. The Trump administration’s anti-immigrant agenda has further destabilized their outlook. Since 2017, the share of Latinxs who say their situation has “deteriorated in the past year” has spiked to nearly half, about the same level as during the Great Recession. A huge share of the population also worries about “their place” in American society, about 40 percent for US-born Latinxs, and nearly 60 percent for immigrants. Nearly two-thirds of Latinx immigrants fear that they or someone close to them may be deported. As Trump’s policies target and divide immigrant communities, it’s unclear how these two social patterns—wavering optimism and volatile levels of political engagement—might intersect. But we do know that if it is made harder for immigrants to gain legal status or citizenship, political participation suffers. There are people who will be energized to become citizens and then vote—and this group has received a fair bit of attention in the press and research. But there will also be many for whom longer periods of exclusion from formal politics mean that they will never become fully engaged…. there is a great “habitual” aspect to voting (or non-voting) and that early adulthood is a critical period in that respect. As for future political engagement, Soehl argues that current political tensions could suppress civic engagement in the long term, rather than spur new political mobilization: “The big question is of course which of these phenomena will be more important numerically. My pessimistic suspicion is that the latter (de-mobilization) will be more important.” If young immigrants, whether citizens or not, continue to be shut out of the political process, the electorate loses the perspective of a growing segment of society, along with the insights they bring about the richness of the immigrant experience, the struggles they face with discrimination, poverty or political alienation. And a generation of migrant youth risks never gaining an equal say in how their country is governed. Whether excluded by law, or just disconnected by social barriers, migrant youth of any legal status are locked out of the democratic instruments for holding the powerful accountable. For society as a whole, a missing immigrant voice isn’t just one less vote; it’s one less conversation with a prejudiced coworker, one less signature for a town’s petition for equal education funding, and maybe one less exploited worker brave enough to show up on a picket line. When immigration policy binds communities into silence, the whole country’s civic fabric unravels.